This Garlicky Herb Cross Rib Roast is very flavorful and full of fresh herb goodness. As the recipe calls for Balsamic Vinegar, make sure you use a good-quality aged balsamic vinegar. I used regular balsamic vinegar in this recipe, but you could also use fig balsamic or a garlic balsamic. This cross rib roast is excellent served with Greek Potatoes with Lemons and Oregano and a beautiful Tomato Salad. This very flavorful Garlicky Cross Rib Roast recipe, comments, and photos were shared with my by Karen Calanchini, Food Stylist and Photographer, of Redding, CA. 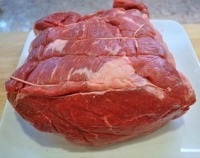 * Cross Rib Roast is also know as Beef Shoulder, Chuck, Shoulder Clod, Boston Cut, and/or English Cut Roast. My roast was covered with a string netting to hold the meat together during cooking. I removed it because I did not want to put the seasoning over the top of the netting, only to have it all come off when removing it prior to slicing. I seasoned the roast then tied one string around the roast to help hold it during cooking. Brush the cross rib roast with the balsamic vinegar, making sure the balsamic vinegar gets into all the nooks of the roast. 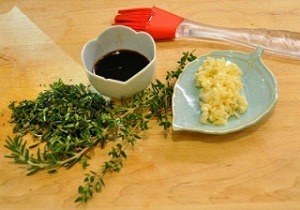 Make a paste of the minced garlic, thyme leaves, rosemary leaves, salt, pepper, and oil oil. Rub paste mixture well all over the roast. Remove roast from oven and cover the roast loosely with aluminum foil and let stand for approximately 15 to 20 minutes. Remember, the roast will continue to cook as it sets. The temperature will rise approximately 5 to 10 degrees. So, pay attention to how long you let the cooked roast sit before cutting and serving. 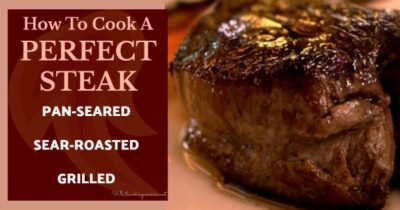 Source: Original recipe is from the The Complete Meat Cookbook, by Bruce Aidells and Denis Kelly. This recipe was very easy to make and is delicious! I would highly recommend this to others. Great job! The roast turned out excellent. It was 5#, juicy, moist and as tender as this cut of meat can be. Very happy with the recipe. Spot on!!! Thank you. Thanks for prep & cooking directions. I added parsley to this and made it in my crock pot. Low for 6 hours. It was one of the best roasts I have ever had. Thank you! Did you sear it first? This roast turned out quite well. We used leftovers to make some delicious roast beef sandwiches. 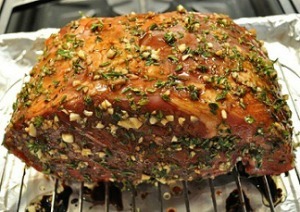 This was an excellent recipe for this roast turned out MR & Rare to suit all of my guests. Do you cook this roast uncovered or with a lid on it, also do you put any liquid in the pan.? I almost leave my roasts uncovered when baking them. Most ovens do not have a setting option to choose between “baking” or “roasting”. Baking is the reference used for cooking baked goods like cookies, cakes or breads, where roasting refers to cooking vegetables and meats. For roasting the beef, you need to pre-heat the oven to 450 degrees Fahrenheit. I tried the slow cooker and at only 4 1/2hrs it was way over done, not sure how someone did six. I wish i would have just roasted it. This recipe is simple and delicious! The first time, I used a fig balsamic and it turned out amazing. 2nd variation was a pomegranate balsamic and cooked on the grill instead of the oven, and it was very good. 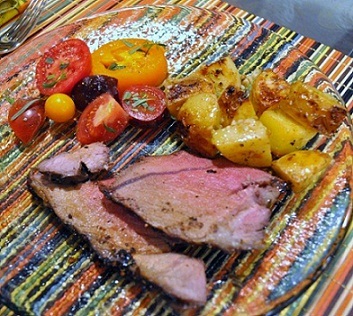 This time I tried a Bordeaux cherry balsamic and used a tri-tip in the oven…wow!